Kochi: Kizhakkambalam Panchayath is an outstanding example of nation building, said Kamal Haasan, while addressing the media at Kitex Garments, Kochi.“I have come here not as a dignitary but as a partner, and will continuously, shamelessly copy the idea implemented by my friend Sabu M Jacob that helps in nation building. My vision is not blurred by party life. With a single vision and healthiest competition both me and Sabu Jacob will work as an individual of civic citizen,”said versatile actor –politician.He was in Kochi for the key hand over ceremony of God’s Villa — a community development initiative of Twenty 20 by Anna-Kitex group. “For executing good ideas, we need power. With sheer perseverance one can overcome any hindrances. Earnestness is the first thing I see here. For nation building, one must change personally. The main goal of neo political leaders is to secure more money for development rather than to earn money”, he added. 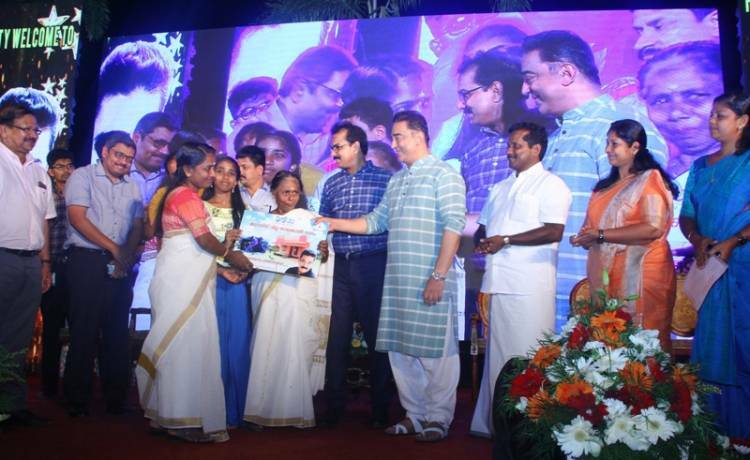 After speaking to the media, Kamal Haasan inaugurated the God’s Villa by handing over the first key to Raji Velayudhan, one among the 37 beneficiaries of the housing scheme. The Kitex MD and Twenty20 Chief Coordinator Sabu M. Jacob presided over the function. “Successive political parties have ruled the panchayat for 20 years. But the life of voters, who were poor,remained the same. That’s why I decided to change their lives. I want to make Kizhakkambalam Panchayat the best in the country by the year 2020.” said Sabu M Jacob, Twenty 20 Chief Coordinator and Managing Director of Kitex Garments Ltd. The Laksham Veedu colonies under Kizhakkambalam panchayat were in a dilapidated condition which made the lives of people miserable.“Twenty20 Kizhakkambalam”, decided to demolish and rebuild these colonies to “God’s Villa”. Twenty 20 along with, Kizhakkambalam grama panchayat has taken up rebuilding of 73 houses in the colonies, namely Njarallur (37 houses), Velangu (24 houses), Kanamburam (8 houses) and Makkenikkara (4 houses). As a first part of the project the completed 37 houses of Njarallur Colony were handed over to the families along with the Possession Certificate by Kamal Haasan who has been here to study the development model of Twenty 20. The contemporary looking 750 sq. ft independent houses are well equipped with amenities to match modern villas with kitchen, European toilet, sink, light and water. The house in four cents includes 2 bedrooms, a hall, and kitchen with car parking facility. Twenty 20 has also provided accessories like fan, fancy lights, furniture, dining tables, mixer/grinder, beds, TV, and sofa sets worth Rs 2 lakh at 50 per cent of the cost. Water connections are provided to each house with independent storage tanks of 1000 litres. A 25000 ltr common water tank, two wells and a bore-well is constructed to make sure uninterrupted water supply for the colony. All these houses built as per Vaasthu Shastra has a strong foundation that supports two storeyed construction. To protect privacy, each house has got a compound wall and gate in addition to the common compound wall of the colony. The colony has paved roads to each houses and got common amenity space for social gathering. BMBC roads are constructed to provide access to Highways. The entire cost for the Njarellur project is 6 crores out of which Twenty 20 has spent 5 crore 26 lakhs and the Panchayath spent 74 lakhs under the government scheme “Laksham Veedu Ottaveedakkal Project”. As part of the welfare activities, Twenty20 Kizhakkambalam had initiated projects for the homeless in the Panchayath way back in 2016. They have completed 300 houses for the poor and renovated 800 houses with modern amenities. The welfare activities of Twenty20 Kizhakkambalam have gained attention across the world. Many political parties like Aam Admi Party, Makkal Needhi Maiam, have visited Kizhakkambalam to learn about this development model. Makkal Neethi mayam Members C.K Kumaravel, Pa Rajanarayanan, Kizhakkambalam Grama Panchayath President KV Jacob , Vice President JincyAji, Eastern Group MD Navas Meeran, Arjuna Naturals Extracts Ltd MD P J Kunjachan were also present during the key handover ceremony.